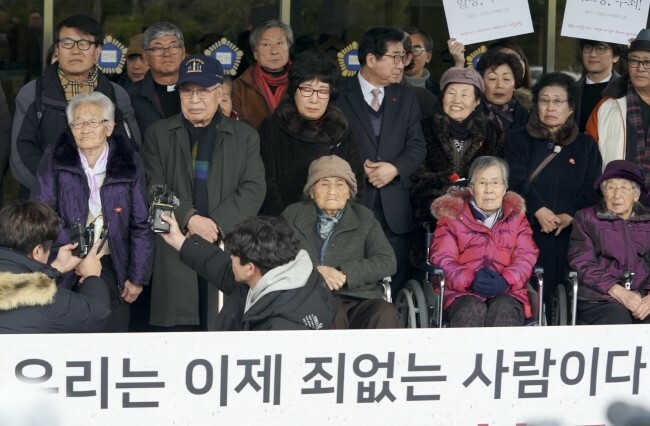 제주위클리 모바일 사이트, Realization of Delayed Justice "I am not guilty"
The Jeju 4.3 Incident is a tragic chapter in history which took the lives of many locals after its beginning in 1948. The 3.1 Incident, in which six civilians were killed by police shootings at a 3.1 memorial event in 1947, became the direct cause for the disturbance on April 3, 1948, which resulted in a tragic event that lasted until September 21, 1954 when the Mt. Halla entry ban was lifted. 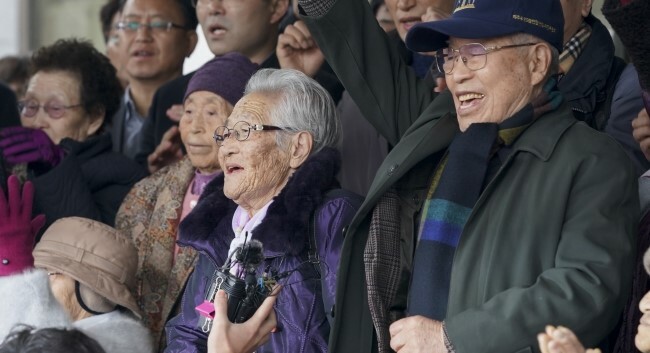 There are 14,233 victims (death, disappearance, lasting injury, and wrongfully incarcerated) officially confirmed by the commission of the Jeju 4.3 Incident Truth and Victim Relief Commission in 2017. The truth report estimates the actual victims as 25,000 to as many as 30,000. At that time, one in ten people in Jeju Island lost their lives. Beginning with the submission of application for retrial on April 19, 2017, the first trial took place on February 5, 2018, the fifth trial on June 14, 2018, and the final decision on December 17, 2018, up to the current dismissal of prosecution ruling. The trials proceeded rapidly because all surviving victims were of old age, between the ages of 87 and 98. In the final hearing on December 17, 2018 the prosecutor applied for dismissal of prosecution. This means that the case is closed regardless of guilt, due to a problem in the process. 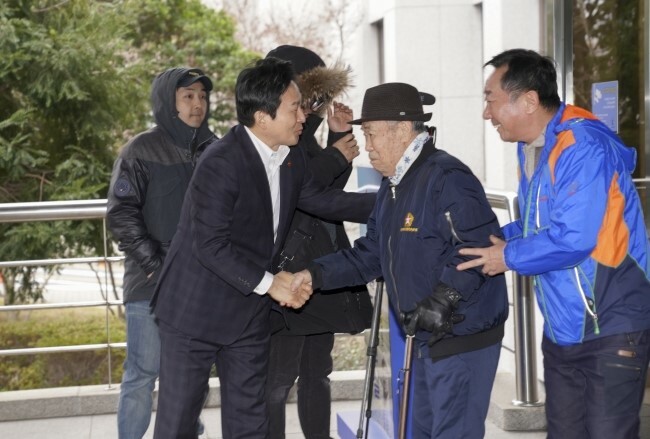 On this day, Won Hee-ryong, the governor of Jeju Special Self-governing Province, visited the court and sympathized with the survivors’ suffering. The governor congratulated on reclaiming the victims’ honor, and commented that although it would be impossible to resolve the 70-year-old suffering and injustice in an instant, that he was happy for justice, albeit delayed, to be served. He commented that the court ruling would be a new beginning for a series of rectifications leading to the clearing of victims’ names and truth discovery regarding a modern tragedy. 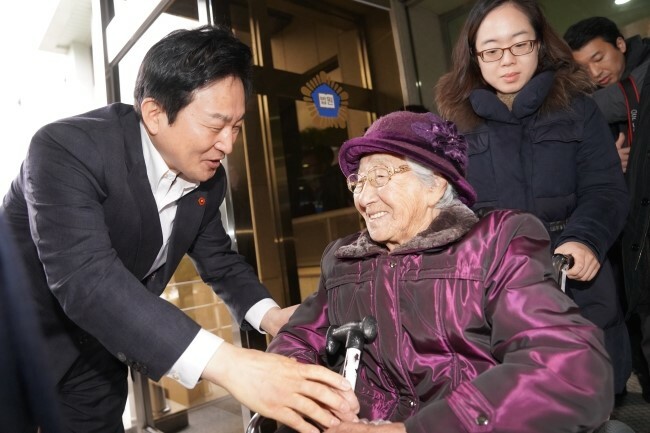 He visited the home of the appellant Yang Il-hwa (90) to listen to her thoughts and greet her for the new year. Following the dismissal of the prosecution, the Jeju Provincial Police Agency handled the contents of the trial on 18 incarcerated victims on February 1. This is a de facto removal of criminal records. On the other hand, Jeju Special Self-Governing Province has strengthened support for 4.3 survivors and their welfare for the complete settlement of the 4.3 Incident, including projects such as the 4.3 road opening (Donggwang village in 2015) and founding of 6 memorial places (Andeok Donggwang village, Namwon Eugui village, Jocheon Bukchon village, Pyosun Gashi village, Hallim Geumak Village, Jeju Yeonmi village), registering the 4.3 memorial site (Sooak Station) as national cultural asset, first additional registration of 4.3 victims in five years, and first excavation of 4.3 victims’ bodies in 8 years, etc., thereby laying the groundwork for resolving the issue. Looking forward, the government plans to strengthen the infrastructure for clearing the name of 4.3 victims through the passing of the 4.3 special act, and to provide further welfare for 4.3 survivors and the victims’ old-age family.